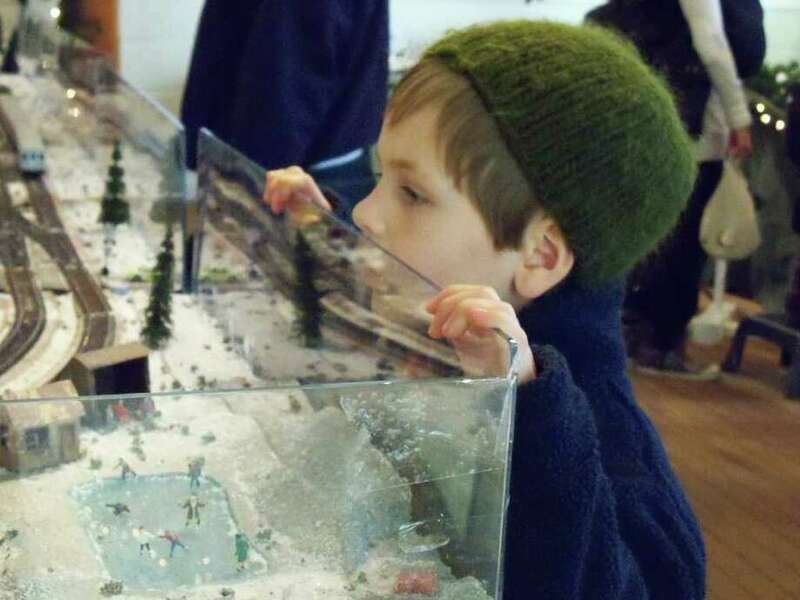 Tom Bukovsky peers into the model train display during the scavenger hunt Wednesday at the Fairfield Museum and History Center. Clipboard and pencil in hand, 8-year-old Sydney Lennon was stumped. She was supposed to find a yellow VW Beetle somewhere in the miniature train display at the Fairfield Museum and History Center. The problem was Sydney wasn't quite sure what a VW Beetle was. With a little hint from her mother that it was a car, Sydney soon located it and was able to put a checkmark next to it on her scavenger hunt list. She and her brother, Nate, 5, were among dozens of kids making the rounds at the scavenger hunt on Dec. 29. When she'd made it through all 15 items on the list, Sydney said the hardest one was the VW -- because she didn't know what it was -- and the easiest was the first: What was on top of the Christmas tree in the middle of display. Sydney said she likes scavenger hunts "because you get to find stuff, and you don't already know where it is." Her favorite part of the Holiday Express Train Show, which pulled out of the station -- and history center -- Jan. 2, was the train that carried Mickey Mouse. "The scavenger hunt we've done in various forms in other sections of the museum," said Walter Matis, program and volunteer coordinator for the museum. "We felt it would be something fun for the kids this year." He said they seem to love the train display anyway, so the scavenger hunt "is just a bonus." Among the items the hunters had to locate were a small boy who fell ice skating, a movie theater, the Sawyerville Station and a Metro-North train called "Half Moon." The display included a farm tucked in the "valley" behind the train trestle, cement mixers and fire trucks. Tom Bukovsky, who is almost 7, said finding the train "Half Moon" was the hardest on the list, but said he had fun looking. Away from the hustle and bustle of the scavenger hunt, visitors could see a different sort of a train model, one that was powered by steam instead of electricity. "Where do you see toy steam trains anymore?" Matis said. "Those were the toys back in the 1860s. That's an awesome opportunity for young people and adults." The show featured eight HO-scale and G-scale train sets, modular dioramas and other collectibles on loan from Hobbytown USA, the Connecticut G-Scalers Club and the Housatonic Model Railway Club.